COMMUNIQUÉ ISSUED AT THE END OF A ONE - DAY POLITICAL SUMMIT ORGANIZED BY THE CONGRESS OF KWARA PROGRESSIVES (C.K.P) HELD AT THE ARCA SANTA ARENA, ILORIN, KWARA STATE ON THURSDAY, 9TH AUGUST, 2018. 1. The Political Summit attended by notable Politicians of progressive background and progressively - inclined Social/Political Groups in Kwara State, attracted high profile Politicians including the Honourable Minister of Information and Culture, Alhaji Lai Mohammed. 2. It was resolved that members of all Progressive Social/Political Groups in Kwara State including all attendees, should join the All Progressive Congress (APC) to actualize their dreams come 2019 in the State. 3. That concerted effort should be made, couple with serious mobilization, sensitizations and proper organizations towards the 2019 Elections in the State to enable the APC to win the state from those holding the State into ransom. 4. It was agreed upon that a purposeful, Progressive and a clear vision Government must be enthroned in Kwara State after the current despotic and dynastic government must have been sent packing in 2019. 5. We also resolved to admonish all Prospective aspirants into elective positions under the platform of the APC in Kwara State to tread safety by subsuming their individual interest into the larger and collective interest of the party and the State. 6. 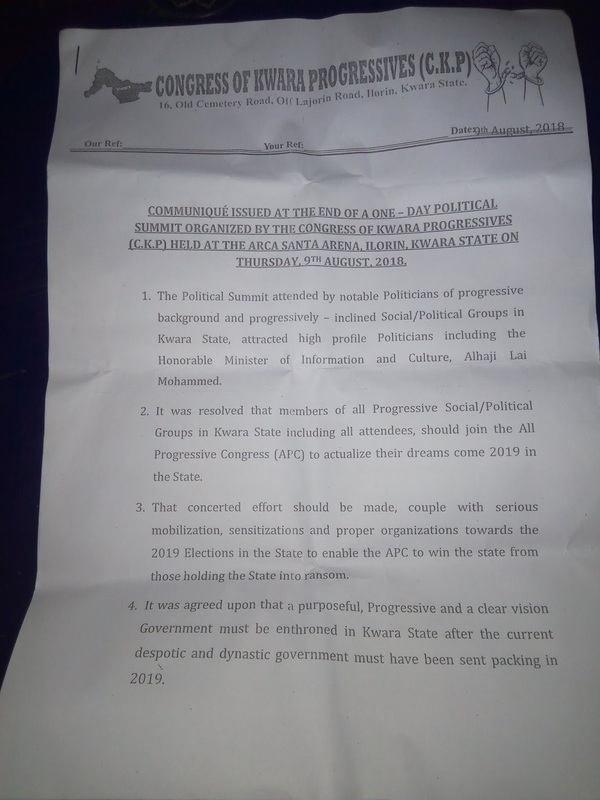 The National Leadership of the All Progressive Congress (APC) was also called upon to ensure a speedy and exhaustive judicial action that would quickly end the agitation of members of the dissolved Kwara State APC Executives who are unjustifiable lying claims to the structure of the party in the State. 7. Members were also implored to adopt fairness, equity and unity of purpose in all their activities in the State. 8. Lastly, such Politicians Summit that would enhance cohesion, unity and progress of the APC in Kwara State were advocated to be replicated in all the 16 Local Government Areas of the State. Over 230 delegates from all the Electoral Wards in Kwara State attended the Political Summit.